A Summertime Classic Abundant in Versatility. Lemon Grilled Chicken offers satisfying freshness with savory zest. With just a few ingredients and 10 minutes prep time, you’ve got a super easy and quick meal. 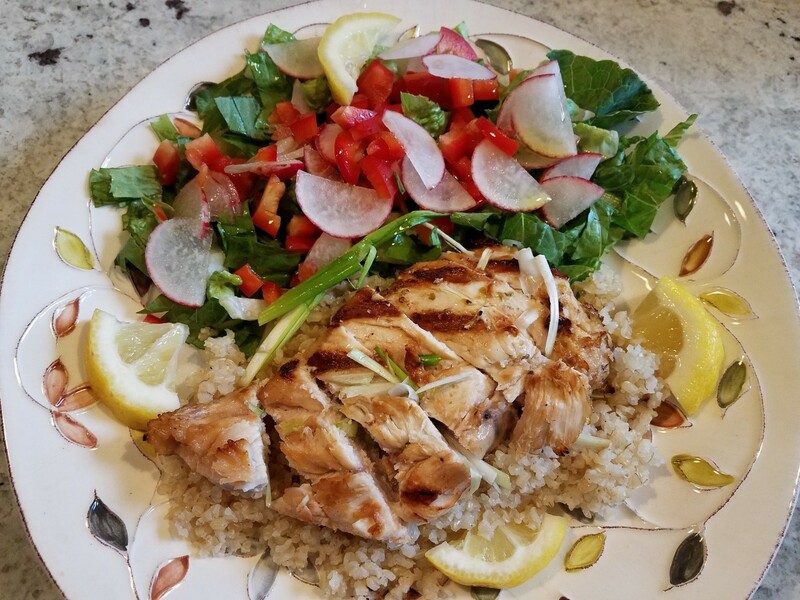 Lemon Grilled Chicken is a full meal sliced over a bed of greens and in season produce. It makes excellent leftovers, as a repeat over fresh produce, in a wrap, or as chicken salad (just had quality mayo, sliced grapes, cubed apple, chopped celery and walnuts or sliced almonds). Grilled summer veggies such as zucchini, yellow summer squash, and peppers make this dish a delectable summer favorite. Using tongs, place the chicken two at a time into a large zip plastic bag. Don’t seal the bag, but hold it somewhat upright. This allows air to move so you don’t pop the bag and keeps juices inside. Gently pound with smooth side of a kitchen mallet until even thickness, a few minutes. Remove and repeat until done. Whisk the first three ingredients in a small glass bowl. Add the marinade to the large zip-top plastic bag with all of the chicken (about four breast halves to a bag). Seal the bag. Move it around a bit to cover the chicken with all combined ingredients. Marinate in refrigerator at least 30 minutes. If you can marinate longer that is fine. It can marinate all day if you want to do this in the morning. Turn the bag a couple times while marinating. Keep an eye on the grill so it doesn’t flare, lowering heat to medium. Cook slowly until you can lift a chicken breast end gently with tongs and so it doesn’t over char, but has a nice grill mark. Grill about 6 minutes on each side or until internal temperature is 165 degrees. After the last flip use a clean utensil to remove so the uncooked chicken juices don’t transfer.